Hello there! 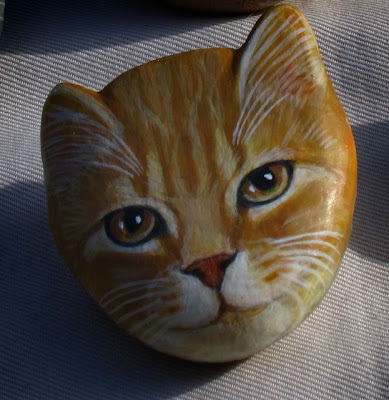 Allow me to introduce myself, I am one of many rockin' cat rocks hand painted by an artist named Phyllis; to view others click here. We make great Chanukah gifts, stocking stuffers, or we are nice to give to your co-workers, friends or families at any time. You don't have to wait for a special occasion to let people know they mean something to you. As mentioned in a previous post, Helen (from Gifts by Helen) sells us cat rocks along with beautiful journals, photo albums and picture frames. We cat rocks are more fun then pet rocks if I do say so myself!